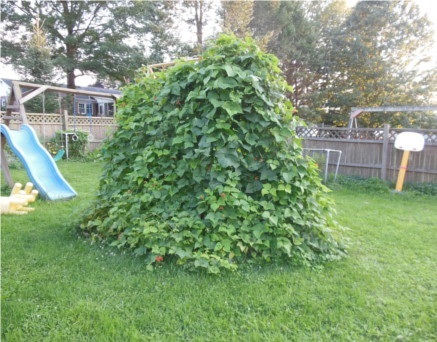 Remember the beanstalk playhouse from last year? It turned out OK. I harvested plenty of beans. Unfortunately, it could only be used as a playhouse if the kids were playing a game of “solitary confinement”. What is the solution? Obviously, we just need to make the structure bigger. Say hello to the new and improved Beanstalk Playhouse. 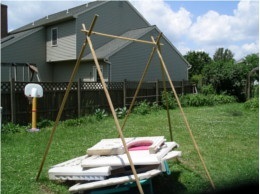 It is framed using 2×2 posts in a tent shape and stabilized at one corner. 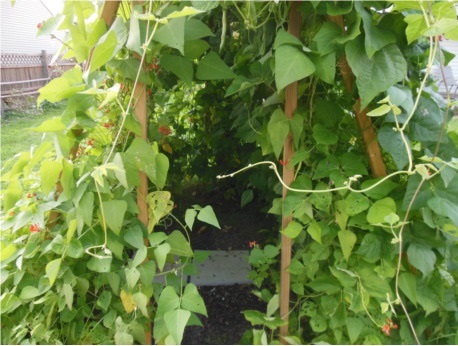 I planted five varieties around the perimeter- two varieties of green bean, one variety of lima bean, a yellow bean, and a scarlet runner bean. I planted green beans on 3 sides, limas on 2 sides, yellow beans on one, and scarlet runner beans on 5. Wait… 3+2+1+5 =…. Either I’m getting really crappy at math or something just doesn’t add up. Would it help if I told you that the structure has five sides? Yes, but it still doesn’t add up. You have more beans than sides, Dave. Off topic- Doesn’t that last sentence sound like something you would hear in a restaurant kitchen? Anyway, back to the funny math. And scarlet runners interspersed around all five. One lesson reinforced from this latest experience is to space your plants properly. The green beans are thriving from their closely spaced plantings. Green beans… Yum! The lima beans, well, an actual harvest would have been nice. The plants are growing but not achieving much; you know, the limas are kind of like [insert name of favorite politician or Jersey Shore cast member]. I may have crowded them out by planting closer than recommended. But this is my first year growing lima beans, so we’ll file that as a rookie mistake.